Despite Nigeria’s latest impressive ranking in the World Bank’s latest ‘Doing Business’ report, the Buhari administration will continue to actively pursue its reform agenda to keep improving the nation’s economy, according to Vice President Yemi Osinbajo, SAN. Prof. Osinbajo further said the oil and gas industry in Nigeria stands to benefit greatly from the administration’s Ease of Doing Business reforms. He said this in his speech on Thursday to mark the 55th anniversary of the Oil Producers Trade Section (OPTS) of the Lagos Chambers Of Commerce and Industry (LCCI) at the Eko Hotel & Suites, Lagos, with the theme: Nigeria: An Investor Friendly Destination. The Vice President noted that Nigeria’s latest ranking in the World Bank’s report was an indication that the Buhari administration’s reforms were producing results. “On Tuesday, the World Bank released its latest report, in which Nigeria achieved the unprecedented step of climbing 24 places in the rankings, and earning a place on the list of 10 most improved economies in the world. “This is fantastic news, but by no means an excuse for us to slow down. Instead we’re taking it as the very reason why we need to ramp up our reforms, for the benefit of Nigeria. There is still work to be done in reducing bureaucratic bottlenecks in the award of contracts and generally in obtaining approvals. Prof. Osinbajo further said the Federal Government, through its sector road map launched in October 2016, is making inroads towards reforming and repositioning the nation’s oil and gas industry. He added that the administration has developed and obtained the approval of the Federal Executive Council for a new National Oil Policy and a new National Gas Policy. 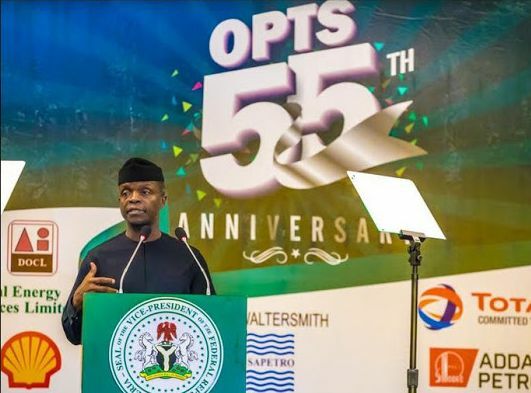 Prof. Osinbajo said, “The roadmap has very specific time-focused targets and like the many bold steps we have taken in this sector since the inception of the present administration, we remain focused on making necessary even if dramatic policy shifts in this sector to grow, deepen and open up the business and opportunities in Nigeria’s Oil and Gas Sector. “In 2016, the Nigeria upstream sector of the oil and gas industry was challenged by the menace of upstream assets vandalism. From a peak production of over 2.30 Million barrels per day recorded at the beginning of 2016 we witnessed a decline to an almost all-time-low of about 1.0 Million barrels per day per day due to incessant vandalism. Many indigenous producers suffered perhaps more than other players in the industry. While calling for more private sector participation in the oil and gas infrastructure development projects, the Vice President emphasised that the Buhari administration will continue to address development in the Niger Delta through its New Vision for the region. “We will continue to address Niger Delta issues and build a peaceful and prosperous Niger Delta, with emphasis on job creation for our teaming unemployed youths, investment in infrastructure, energy and promotion of sustainable livelihood,” he said.